Fragment-based drug discovery (FBDD) has emerged in the past decade as a powerful tool for discovering drug leads. The approach first identifies starting points: very small molecules (fragments) that are about half the size of typical drugs. These fragments are then expanded or linked together to generate drug leads. Although the origins of the technique date back some 30 years, it was only in the mid-1990s that experimental techniques became sufficiently sensitive and rapid for the concept to be become practical. Since that time, the field has exploded: FBDD has played a role in discovery of at least 18 drugs that have entered the clinic, and practitioners of FBDD can be found throughout the world in both academia and industry. Literally dozens of reviews have been published on various aspects of FBDD or on the field as a whole, as have three books (Jahnke and Erlanson, Fragment-based approaches in drug discovery, 2006; Zartler and Shapiro, Fragment-based drug discovery: a practical approach, 2008; Kuo, Fragment based drug design: tools, practical approaches, and examples, 2011). However, this chapter will assume that the reader is approaching the field with little prior knowledge. 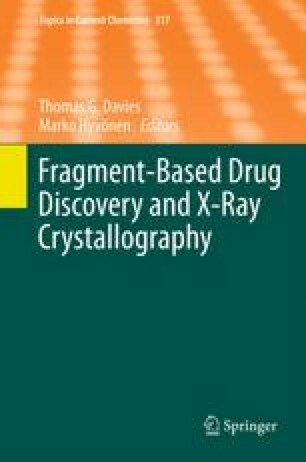 It will introduce some of the key concepts, set the stage for the chapters to follow, and demonstrate how X-ray crystallography plays a central role in fragment identification and advancement. I would like to thank Monya Baker for a careful reading of the manuscript.